A team of 16 architects, landscape architects, city planners, and community development folks spent the better part of last week in Huron, SD for a design:SD charrette. The topic this time around was Downtown Huron. How can we design for a more vibrant downtown? What elements are needed to reinstate pride in downtown? What do you wish existed downtown? The team had an opportunity to visit with community folks on Wednesday night about those very questions. About 80 community members attended the meeting to add their perspective. 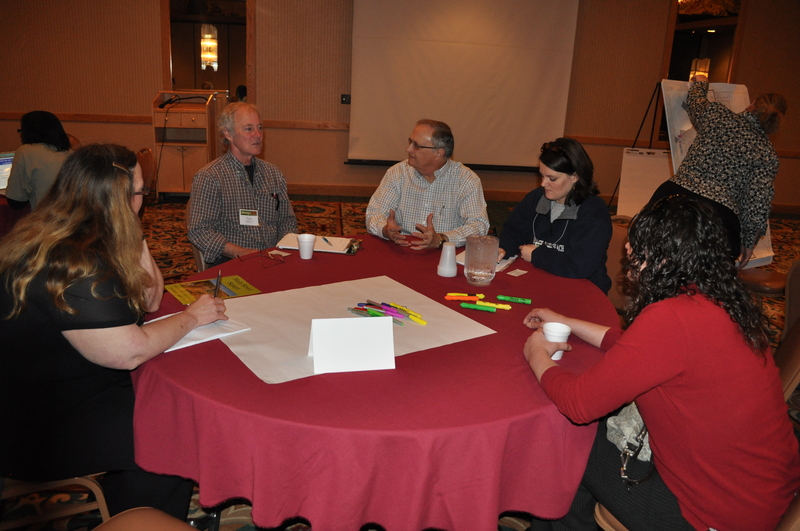 The community had a chance to dig in further at roundtable conversations on Thursday morning. The event schedule for design:SD Project Huron is official! If your a local resident and would like to participate, there are several specific opportunities. Learn more below! • Wednesday, April 27th beginning at 6:00 pm—Free Community Meal and Design Workshop. The design team will enjoy a meal with the community, and then lead participants through several stations where the team can gather input and ideas about specific downtown issues. Please RSVP for the meal to the Chamber office at 352-0000. • Thursday, April 28th at 8:30 am— Community Roundtable Discussions. Community Roundtable conversations will include downtown beautification, green space, and downtown business development. Additional roundtable topics will be generated based on feedback from the evening meeting on the 27th. • Thursday, April 28th at 7:00 pm—Open Design Studio. The design studio will be open to the community from 7:00 to 7:30 for those who would like a sneak peak at what the team is working on. This feedback loop allows the team to make sure they are on track with design solutions and concepts. • Friday, April 98th at 7:00 pm—Public Presentation. The entire community is encouraged to see the results of their input and the team’s hard work on Friday evening. Design team members will show a series of boards that visually describe solutions and ideas for Huron’s downtown. A question and answer period will follow the presentation. If you have questions, please contact Lindsey Karlson at the Rural Learning Center at lindsey.karlson@rurallearningcenter.org or Peggy Woolridge at the Huron Chamber at peggyw@huronsd.com. Downtown Huron, here we come! Yes, you heard right. Design:SD’s next official stop is the community of Huron. On April 27th, a team of architects, landscape architects, planners, engineers, and community development professionals will roll into town to take on our first downtown design project. Our efforts will compliment a new downtown master planning process that is in motion, and is being brought to the folks in Huron by the Huron Chamber & Visitors Bureau and the Greater Huron Development Corporation. And the only one we’re missing is you! If you’d like to join the team, or just learn more about design:SD, please contact Lindsey Karlson at lindsey.karlson@rurallearningcenter.org or by phone at 605.772.5139. More details and schedule coming soon!